Truman Doctrine was America’s initiative, as the global steward of capitalism, to ‘develop’ the ‘underdeveloped’ areas of the world through capitalism, science and technology. This was in response to threats of the poor countries of Eastern Europe falling under the grip of communism. 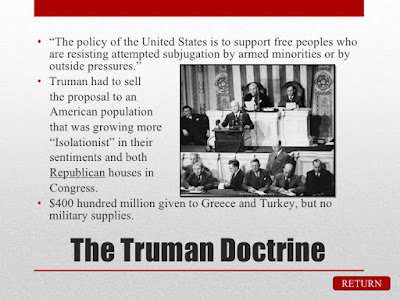 This Truman doctrine translated into a dual strategy – one for its European allies, another for its non­ European ones. The US donated free capital to the former, so that the core nations of global capitalism – the UK, France, West Germany – could rebuild their war­ wrecked economies quickly. For the latter (the erstwhile colonies), it shepherded into existence the Bretton Woods institutions, the International Monetary Fund (IMF) and the World Bank, whose job it became to expand and consolidate capitalism in the furthest reaches of the Third World. 3. Financial aid helped the countries to invest money in social upliftment of the people, create infrastructure, promote trade and commerce. However Truman doctrine has also caused much heartburn especially in post colonial countries. 1. Aid was never unconditional but came with aid conditionalities which basically imposed ideals of democracy, capitalism, austerity etc on the country. Since these measures were not indigenous , it often had an adverse impact on the people in the region. 3. There has been discontentment with the monolithic view on development influenced by the Western powers. The aid conditionalities ensure that development takes place in a way the West desires. This often leads to rising inequality which causes much heartburn. It is to be realized that for the process of development to be engendered, it is necessary to ensure that the process is indigenous keeping into account the sensibilities of the people and the needs of the region. A uniform policy not taking into account the domestic sensibilities will not yield much result.